As an instructor at Refreshing Mountain, I always like to give the patrons a unique experience each time they come. That’s our desire here at RMC; we love new things, and we love to accommodate you whether you’re a returning guest or a new adventurer. When things are constantly changing it keeps me excited for work and for the upcoming year! Keep in mind – an excited tour guide is a good tour guide. Check out all our new things coming out this year, and comment on a suggestion, or what you’re excited about. Canopy Tour and Activities Shed! If you came on our Canopy Tour before, sometimes it can be hard because it seems like you have to juggle between the office, the canopy tour, and the store if you want to buy some things. 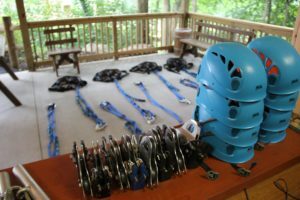 We moved forward in building a Canopy Tour shed to centralize all these things, and create a great atmosphere for your group during the Zip Lines. This building will have a roofed in area to harness up, as well as T-shirts, snacks and drinks right there. There will always be a tour guide behind the counter able to talk with you, and meet with you before the tour. We’ll also have an Ipad for you to check out our blog and Facebook right on location! It’s going to make a more enjoyable atmosphere and community dynamic for you and will make things much more convenient and fun! 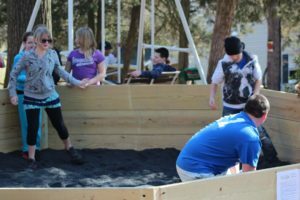 For those coming to experience our canopy tour, or those who are spending the weekend here the Gaga pit should be a fun stop for you! We’ve fiddled around with what to put between Bunks 3-4 and the dining hall, and this one seems to stick the most. Many groups are having a ball as they dodge, jump, and throw their weight around in this new sport. It’s located only a few hundred feet from the Office were you check in for your Canopy Tour, so if you arrive early enough, it’s a great game to get your blood pumping before the zip lines! We have broken ground on the first of 13 cabins! Although we have been approved to add 13 individual cabins, we will work on 3 this year, to be finished by the end of June. Each cabin will have a kitchen, living area, two bedrooms and a bathroom. Furnishings and equipment include rustic furniture, microwave, refrigerator, and an oven, dishes, cooking utensils, silverware, kitchen towels and glassware. Bath towels and bedroom linens, including mattress covers, pillows, blankets, sheets and pillow cases, also are included. All cabins will have fireplaces! 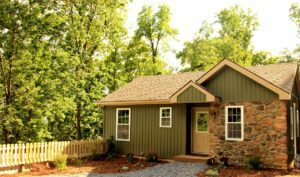 This will be ideal for small groups of less than 20, families and personal retreats, and Leadership and Elder’s retreats. For youth groups and organizations that have always been struggling with having enough room for their retreat, this will be adding quite a bit more space, making things more convenient for your retreat! Or if you have a group of friends, (not co-ed) or a family that is interested in coming down for the weekend to do our Canopy Tour, or if you are simply interested in a weekend away, these Cabins will be just right for you. We’re excited to see them completed and we’re already receiving a high demand for them. Canopy Tour Instructor, Social Media Coordinator. Book Your Zip Line Canopy Tour Today!